Durable and adjustable for seed, fertilizer and salt/ice melt applications. The easy-crank, scoop design is lightweight, easy to use and maintain. Enclosed gears to protect from debris. Ideal for small areas where a larger spreader can't go. Durable poly hopper, trigger gate control, thumb gate adjustment and enclosed gears make this a great spreader to keep on-hand for all-season use. 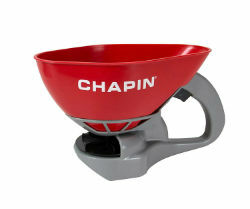 1.6-Liter / .3-Gallon capacity scoop spreader.